AOOOGAH! Picture me doing the Snoopy happy dance! We finally have a restaurant that's worthy of talking about. Sadly, I must admit that our fair city has not been kind to many hopeful bar owners and restauranteurs. It's earned the slogan "Another one bites the dust". Now to be totally fair, there are a few other worthy restaurants in the Cape that I haven't blogged about. However, this one is a recent favorite of mine. These days of so many choices, those who succeed in this business have to tick all the right boxes. Ford's Garage does just that, and so, I must toot their horn! Now open in the Cape and readied to open this fall in Miromar Outlets Ford's Garage is expanding east and west in Southwest Florida. A hugely popular downtown Fort Myers eatery, it's a much welcome addition to it's neighbors. Since 2001 four or five different restaurants have occupied its Cape location. None were note worthy. Cape Coral locals are thrilled to finally have an establishment (that isn't a national chain) with true staying power! 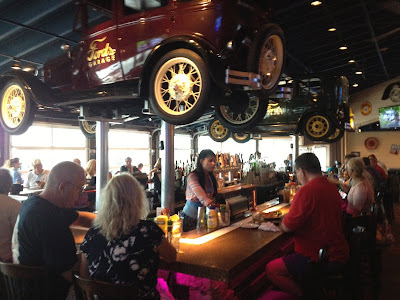 Ford's Garage claims they'll give you the vibe of being in a 1920's service station/prohibition bar and they deliver - minus the axel grease and fear of authorities, thank goodness! Inside the gourmet burgers are great and the craft beer selections seems endless. 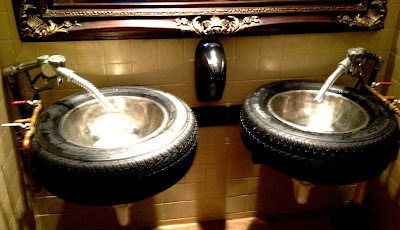 Even the bathrooms are inventive. The place exudes fun down to the classic car horn sound - AOOOGAH! I love the service station bell ringing as you drive up. My teenage daughter rolled her eyes as I circled the parking lot to drive over it. "Another one bites the dust" may have been the theme for many restaurants throughout the Cape but, not anymore! At least not this time. This one will surely stick! Let's hope the trend continues. 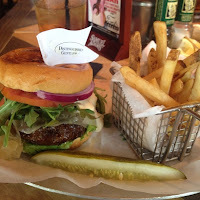 If you are a beer connoisseur, there's a terrific beer selection - perfect pairings for great burgers. It's a deliciously fun place to visit! I'm looking forward to the Miromar Outlet opening. Open: Mon-Wed 11am-12am, Thurs 11am-1am, Fri-Sat 11am-2am and Sun 11am-10pm. Love Fords Garage! The beer is fantastic and the burgers are great. Haven't tried the Cape location yet. Must do soon!